Curt Ebbesmeyer here, the oceanographer who tracks all things afloat. For an introduction, please see Smithsonian Magazine July 2001.
not know how to go about tracing this derelict. Can you tell me if this is a Boston Whaler vessel? Any insights will be most appreciated. 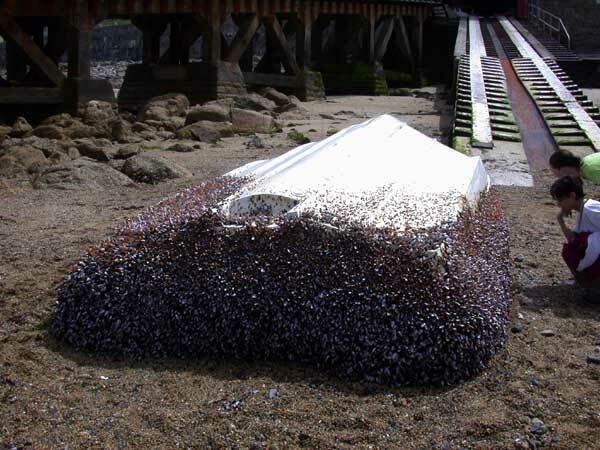 The appearance of this derelict fiberglass hull in June of 2003 near Land's End on the western coast of Great Britain drew local interest and also sparked an international e-mail based investigation into its origin. The boat had been adrift in a keel-up orientation for some time, as the enormous growth of barnacles and other marine life indicates. The water line in the inverted state is easily deduced from the marine growth. The starboard side has been sheared away, but otherwise the hull looks undamaged. Hauled above the tide and surf line, the boat was flipped back onto her keel where the distinctive lines of a Boston Whaler became more apparent. 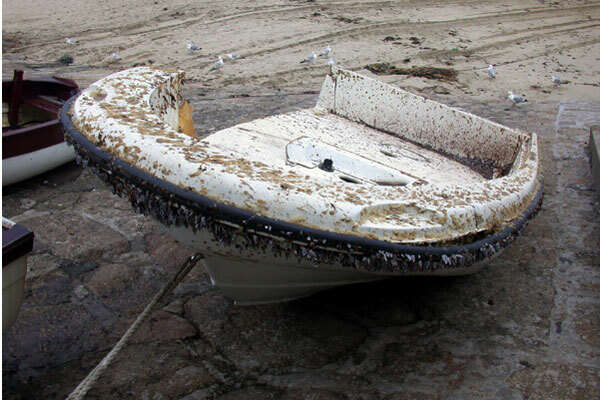 With this lengthwise slice of the starboard side removed, the unique Unibond foam construction of a Boston Whaler made identification certain. What other fiberglass boat would have been afloat this long? This seldom seen view of a newer Boston Whaler boat hull shows the enclosed bilge spaces formed by the three-piece topsides construction. Of course, the ultimate question: "Is the foam waterlogged?" 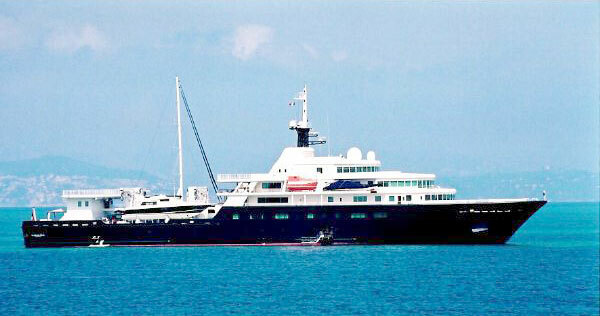 After scraping away a great deal of marine growth, the vessel's name could just be made out: TENDER to LE GRAND BLEU. be a fairly recent model as it has the Accutrack hull shape. of the hull can be deduced from this number. I am certain will favor you with an email reply. Land's End where England juts westward into the North Atlantic Ocean. On Thursday, June 5, 2003, two merchant ships report a capsized skiff. By 0930 hours, rescuers launch a lifeboat from Sennen Cove. It's a false alarm--a small white vessel eight miles southwest of Land's End. 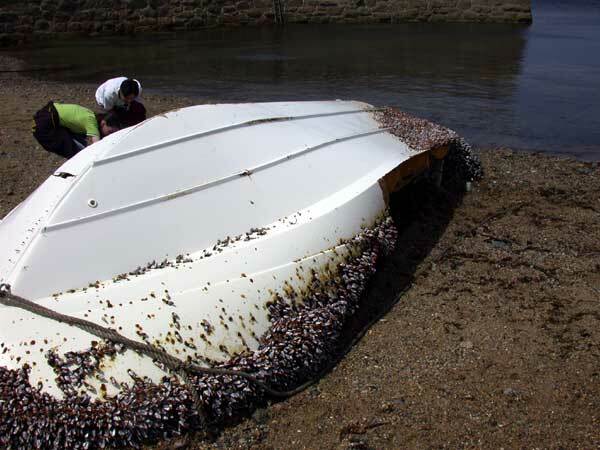 Massive colonies of gooseneck barnacles echo a lengthy sea drift. To avert further alarms, the search and rescue party towed the fiberglass craft to shore. Next week, Cornwall's playwright-beachcomber Nick Darke alerted me. Thus began my investigation of the second longest drift of a derelict (a vessel abandoned at sea) on the North Atlantic! Braving the stench of moldering barnacles, Terry George could barely decipher TENDER TO LE GRAND BLEU on the port side of the skiff. Despite missing most of its starboard side which would have sunk most vessels, plastic foam sandwiched between its inner and outer plastic hulls kept the boat afloat. Armed with Terry's photos, the tender's origin emerged from a flurry of worldwide email. Ed Perry, a park ranger at the McLarty Museum devoted to Spanish Galleons wrecked along eastern Florida, immediately forwarded my query to Dr. Blair Witherington, Florida Fish and Wildlife Conservation Commission and Florida Marine Research Institute: "The boat has the gestalt of a Boston Whaler (BW)." Blair's insight sent me internet surfing for the legendary builder of unsinkable boats. Jim Hebert suggested BW's Chuck Bennett: "Given the 12-digit Hull Identification Number, I could find the original owner in BW's data bank. 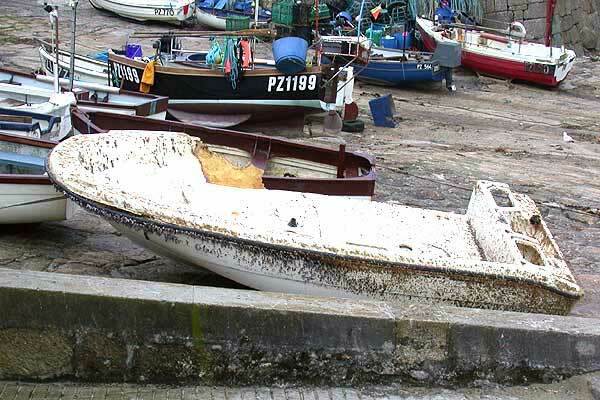 This number is located on the outer transom towards the starboard side." "Found it - USBWCAM541 H900!," Terry emailed. From the ID, Chuck directed me to Targa Yachten, BW's dealer in Hamburg, Germany. "We sold it in March 2000 as a tender for the Motor Yacht Le Grand Bleu (LGB) launched in Bremen, Germany," replied John Argenton. "During summer 2000, LGB cruised to the Mediterranean Sea. In November 2000, on a voyage to New York, heavy seas washed the tender overboard into the mid-Atlantic." From Terry's photos, John deduced that "Somebody found the tender before stranding, cut the fuel hose and removed the engine, center console and bench seat. The original Yamaha F100 four-stroke engine weighs about 361 pounds. If it came loose and dangled for a time, there should be some damage at the stern, but I see none around the engine bolt holes or on top of the engine well." At 354 feet long, Le Grand Bleu is one of the world's ten largest yachts. Accouterments include an aquarium, a 72-foot sailing yacht and a 68-foot power launch. The 18-foot Dauntless rested on the foredeck ready to assist. After the Atlantic storm, Le Grand Bleu steamed to New York leaving Dauntless adrift on her epic voyage. Her odyssey ended in England while Le Grand Bleu cruised in the Indian and Pacific oceans. My experience with similar-sized transoceanic derelicts suggests Dauntless drifted roughly ten miles a day. At this pace, the tender wandered more than 9,000 miles! "An intrepid little tender," quipped Diane Byrne, Power & Motoryacht magazine, "with a serious case of wanderlust." The drift of the Dauntless is the second longest in North Atlantic history. Phil Richardson, Woods Hole Oceanographic Institution, previously summarized historic derelicts on the North Atlantic. During the late-1800s, storms and accidents disabled hundreds. So many in fact, that to prevent collisions, the U.S. Revenue Cutter Service routinely hunted and sank abandoned sailing vessels. Phil discovered six which stayed afloat longer than a year and one longer than 900 days--the schooner Fanny Wolston completed a circuit 'round the North Atlantic gyre in 1,100 days. Jim Boos, owners' representative onboard, looked up the tender's loss in LGB's logbook. On November 20, 2000, in position 37.4° N, 60.1° W Le Grand Bleu encountered Force 8-9 weather. Four hundred miles northeast of Bermuda, gales and high waves swept the Dauntless into the Bermuda Triangle. Dealing with a special drift spurred me to further investigate. Given the initial latitude and longitude, charts of mean ocean currents for fall as well as trajectories of Gulf Stream rings from that area indicate that the tender may have looped southwest toward Florida. The mean transit for messages in bottles from Florida to England is 14 months leaving 16 months for Dauntless to meander about the Sargasso Sea. Trajectories of historic derelicts also suggest she might have zig-zagged eastward to the Azores. Where and when did the salvers strip the tender? Early in the odyssey, I'd guess. 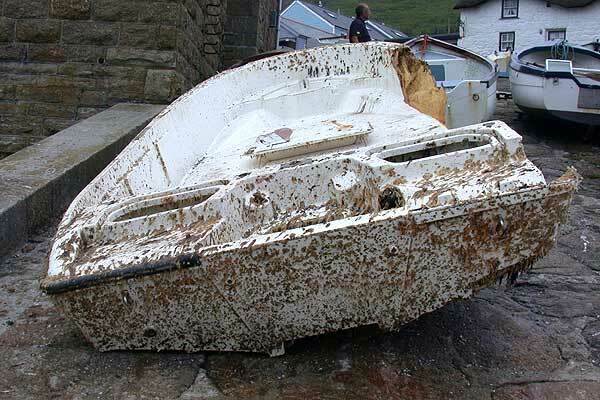 Within months, marine conditions would have rendered the engine worthless. Furthermore, if it hung very long from the stern, waves would have wrenched the engine mountings. As the storm tossed the tender overboard from LGB, I suspect violent lurching snapped off the tender's side. Salvers, finding her gravely damaged, claimed all of value. Weather charts and sea surface temperature maps may help ascertain Dauntless' drift. With substantial windage, however, the skiff traveled faster than surface water. Furthermore, the windage changed over time given the barnacle growth and removal of the engine. With so many assumptions necessary for an accurate drift reconstruction, I suspended my research. Dauntless returned me to childhood when my mother read aloud The Little Engine That Could. The little tender that could...and did! The boat's center console, helm seating, hatches, railings, navigation lights, cleats, and outboard motor are all missing. The presumption is that they were removed by a previous salver and the stripped hull set back adrift on the Atlantic. 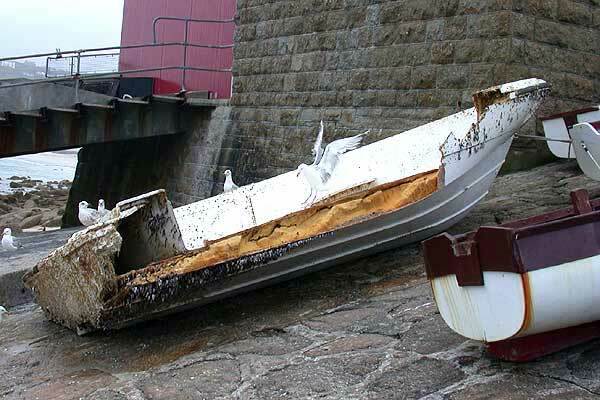 The transom appears undamaged, further evidence the engine and its rigging were carefully removed at some point. 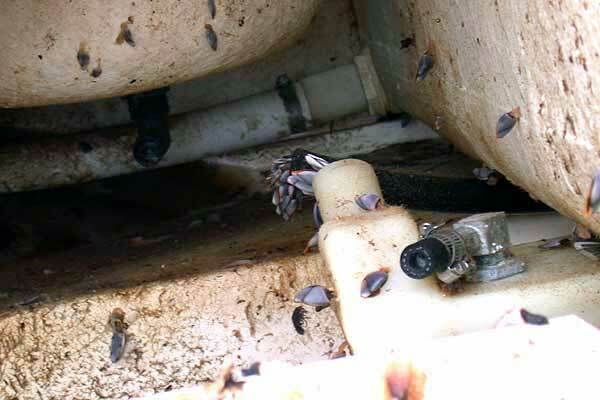 Clean cuts of fuel lines and other bilge plumbing were made by something other than the sea itself. 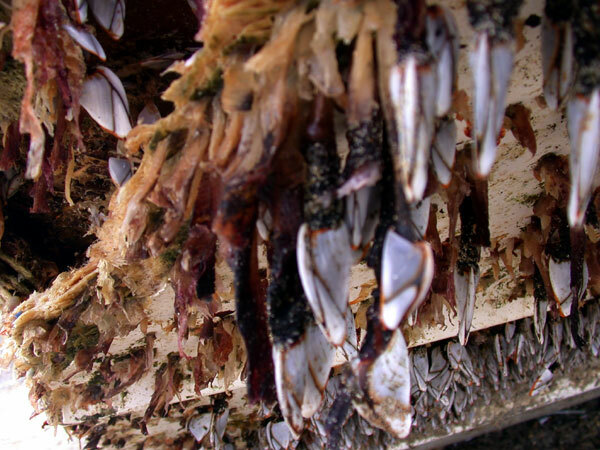 Barnacles and other marine life found a comfortable home on the derelict hull during its 30 months of drift across the Atlantic Ocean. Le Grand Bleu was seen recently in the Mediteranean. She is designed as an "expedition yacht," capable of making long independent voyages. As seen here, she carries a 72-foot sailing yacht and an 68-foot motor yacht among her auxuliary vessels on board. Also noted, Paul Allen of Microsoft is often attributed as the owner of Le Grand Bleu but this may be a myth. Cellular telephone pioneer John McCaw is thought to have had the fabulous expedition yacht built. Who really knows? Most recently, Russian oil billionaire Roman Abramovich has been cited as the owner, possibly having bought her in July of 2003. Now reported as the 6th largest private yacht in the world, Le Grand Bleu may be slipping in the rankings as word comes of more 400-foot "giga-yachts" now being built. They will probably have Boston Whaler's for their tenders, too. 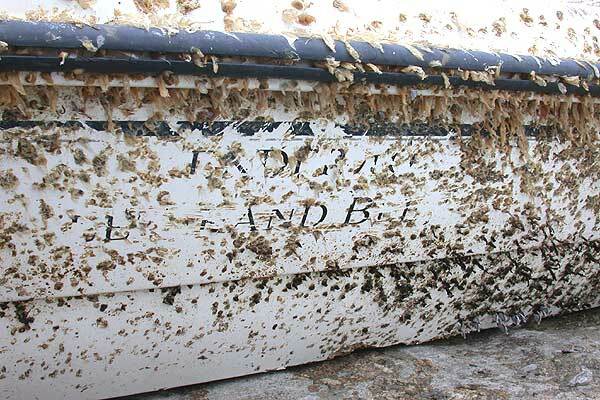 In all, it is a quite amazing story that shows two most interesting things: the unsinkable nature of a Boston Whaler hull, and how much of a global village our world has become. Many thanks to Terry and Curt for their permission to use their work in these pages. The page has been accessed 95890 times. This article first appeared December 28, 2003.